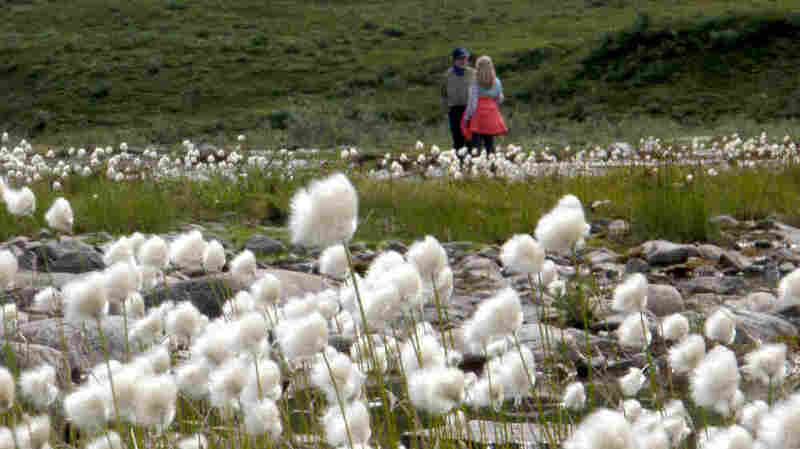 Conan's Alaska Adventure, Part Two : Blog Of The Nation In the second installation of Neal's travelogue from Alaska, the riders happen upon a mystery, in the form of a pile of feathers next to a glacier-fed stream. The Alaskan wilderness is a long way from the beach. Neal Conan stands with Gretel Ehrlich in the fields of cotton grass at Cline Creek. A revelation met the riding column after a boggy, buggy trip to Cline Creek. Writer and former guide Lynn Schooler pulled the first sign of the mystery from a pile of feathers that marked the destiny of a smaller bird at the talons of an eagle — the improbable but unmistakeable wing of a sea gull next to a glacier-fed stream in a treeless valley deep in the remote Alaskan Interior. As the riders progressed, they saw a profusion of unruly pond cotton scattered through a wide stream bed with alternate patches of tumbled stones and moss soft as baby booties. And they saw confirmation — two adults schooling a fledgling gull who complained loudly at the injustices of a world that provided just a few short weeks to learn to find its own food and strengthen its wings for the long flight south. Later, at dinner, no one knew exactly what species of gull found its way to nest at Cline Creek or where it traveled to filch french fries in winter. And as if summoned, a gull appeared over the camp and wheeled across the sky. After consulting my copy of Sibley's on my return home, I believe these are short-billed American mew gulls. The size and the breeding area look right. Coloration is not perfect but, as the author notes, gull identification can be especially maddening, and individuals vary.